In 2010, Roy Fares, won Sweden's Best Pastry Chef competition. He lives in Sweden, but loves to visit the United States. California seems to be his inspiration for this book. He talks about L.A., Hollywood, Palm Springs and Beverly Hills and the delectable treats he enjoys and his favorite places to get them. This book includes 50 of his favorite classic recipes with his own twist. He has taken our Classic American Cakes, Cookies, Pies and Baked Goods and reduced the sugar, but these are not low-sugar recipes. He has just reduced the sugar a little and found the "perfect balance". I love the style of this book. It includes some of my favorite food pictures. The old-fashioned, rustic, pics are so comforting and make me feel right at home. The smell of the book even makes me think of my Grandma's old books. The recipes range from beginner to intermediate. I tried his Chocolate Espresso Bundt Cake. 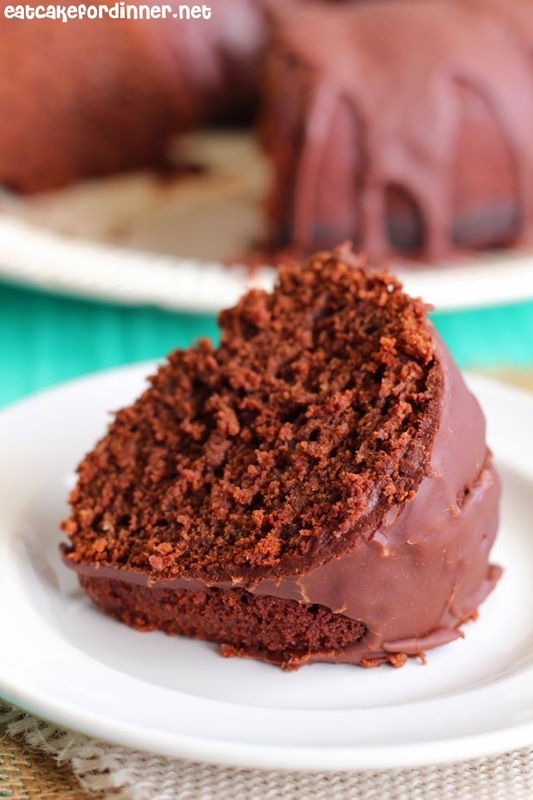 It is a very dense cake with a deep chocolate flavor and it's not overly sweet. I wanted a sweeter glaze, so I opted to make my own recipe instead of his. The recipes are written using a Convection Oven. If you are baking with a regular oven, then it is suggested to increase the temperature by 25 degrees Fahrenheit. He also suggests adjusting the recipes if you live at high altitude. I do live at high altitude and honestly, the only time I have made adjustments is when I am making candy. I wasn't even sure how to adjust for baking at high altitude, so I looked it up. One of the suggestions is to increase the oven temp. by 25 degrees and since I was already going to increase the temp. 25 degrees for a regular oven, that would have meant my cake would bake at 400 degrees and that is way too hot. So, I took a gamble and made the recipe "as is" and it turned out just fine. That doesn't mean every recipe in this book will turn out fine without making adjustments, so you'll have to decide for yourself. P.S. if anyone has any suggestions of how to adjust a recipe at high altitude, then send them my way. Every recipe sounds amazing. Some of the other desserts I can't wait to try are: Peanut Butter Cupcakes, Snickers Cheesecake, Banana Chocolate Chip Pudding, Nutella Cake Pops, Magnolia Bakery's Banana Cake and Chocolate Fudge (it has dulce de leche sauce and marshmallows in it). This book is available for purchase now. Preheat oven to 350 degrees convection function (or 375 degrees for a regular oven). Grease and flour a 9-inch bundt pan. Sift the flour, baking powder and salt in a bowl. Melt the butter in a saucepan, add the cocoa powder, espresso and water and whisk into a smooth mixture. Remove the pan from the heat and add the sugar, vanilla, sour cream and eggs; mix well. Mix in the dry ingredients and whisk together until smooth. Pour the batter into the prepared bundt pan. Bake for about 45 minutes or until a toothpick inserted in the center comes out clean. Let cool in pan for 10 minutes, then invert to a wire rack and cool completely. Chocolate Glaze: Melt the butter, corn syrup and chocolate in a water bath. Stir together into a smooth icing. Let the icing cool to lukewarm temperature. Place a baking sheet under the rack with the cooled cake and pour the glaze over the cake. Allow icing to set. Melt butter in a small saucepan over medium heat. Stir in the cocoa until a paste forms. Remove from heat and add the remaining ingredients. Stir until smooth and creamy and pour over cooled cake. I received this book from the Publisher for the purpose of this review, but all opinions expressed herein are my own. Chocolate and coffee! Looks great! And I am sure tasted amazing too! 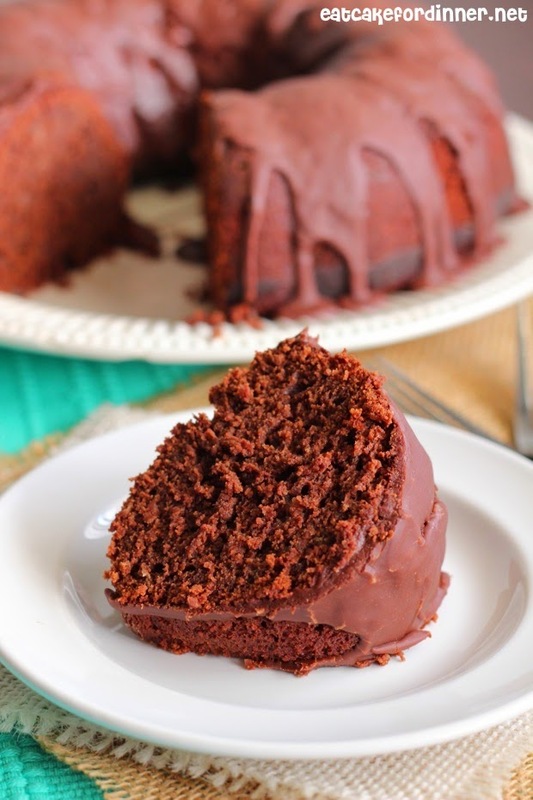 Sounds yummy--I have a new Bundt pan, so I may need to try this one out! How much liquid is in a shot of espresso? I would probably use instant espresso as a substitute. Looks like a fun book! About a normal liquor shot glass. See one at your local coffee house or use 1/4 cup coffee as the author did. Mmm this cake looks delicious!! Love the espresso - coffee is so good in chocolate cakes! Seriously, why not follow the recipe? Your choice to alter the coffee type seriously reduces the coffee's flavor value. Wish I had a slice sitting in front of me right now! This looks so good!